I apologise if anything doesn't make sense. I haven't done any professional networking before, only studied it at uni 3 years ago and everything is a little blurred. We are a software company trying to create some development environments behind a VPN. 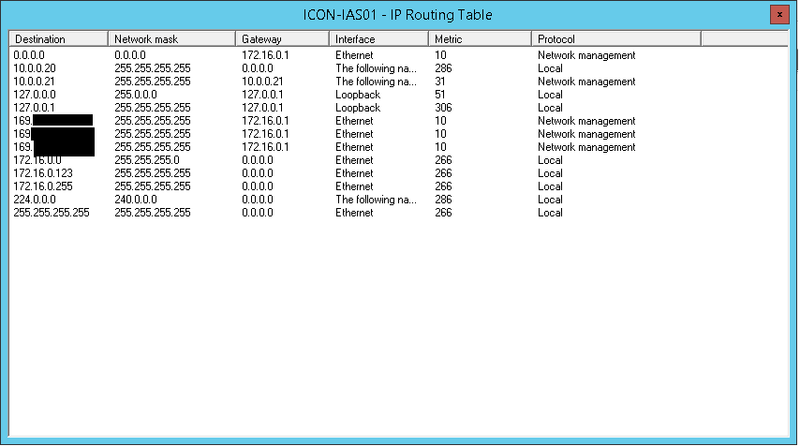 I have created a windows VPN service in windows server 2012 R2 using RAS to a new network I have created in AWS. The VPN works perfectly well and I can RDP into my current server when connected. Yet most the work I do I would like to still be part of my companies local network, in which I click and enable the "Use default gateway on remote network" flag in the IPv4 settings on my local machine, like I do when we connect to our clients with success it stops working and I can not ping or find my servers. Uncheck the default gateway and it works again. My early suggestion is an address conflict? Our internal network uses the 192.168.* . * subnets (unsure of the full details, as we did not do our internal network) yet I found that there is a DHCP Server on 172.30.0.254, could this be causing the conflict even though they would be different netmasks? Below is the routing table. I am trying to RDP into 172.16.0.123 which works if the use default gateway is unchecked, yet can't find it when it is flagged. I have been assigned the internal ip of 10.0.0.21 when the VPN is successful. Has anyone come across any similar issues? I'm guessing you want to route basically all traffic through the VPN. Without seeing your routing tables, my suggestion is the usual problem in this case: the VPN traffic can't itself go over the VPN. Ensure that you have a route for the VPN endpoint specifically (i.e. you aren't relying on the default route to get to the VPN server you connect to on the client); that route should not go over the VPN. That should fix it. Not the answer you're looking for? Browse other questions tagged windows networking windows-server-2012-r2 rras or ask your own question.